Our Pipette Apparatus offers a simple method to determine the particle size of soil; particles smaller than 38 microns in soil. 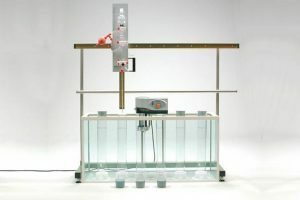 The pipette apparatus can be placed on a laboratory table. Standard set consists of a runner with pipette holder, a table frame, a glass tank, a heating element with thermosta and stirrer, pipette upper section and pipette lower section, pipette balloon, glass sample cylinders, rubber stoppers and sodium hexametaphosphate. The standard set consists of a runner with pipette holder, a wall frame, a glass tank, a heating element with thermostat and stirrer, pipette upper section and pipette lower section, pipette balloon, glass sample cylinders, rubber stoppers and sodium hexametaphosphate.